Every time the winter hits, I need to find products that work the best for me when it comes to my skin. Personally, I have noticed that slathering on a bunch of products will not make your skin better. The best way to have the perfect plump skin is by knowing what products work best for you! Now I have to say, I am not the one to stick to one product for too long. 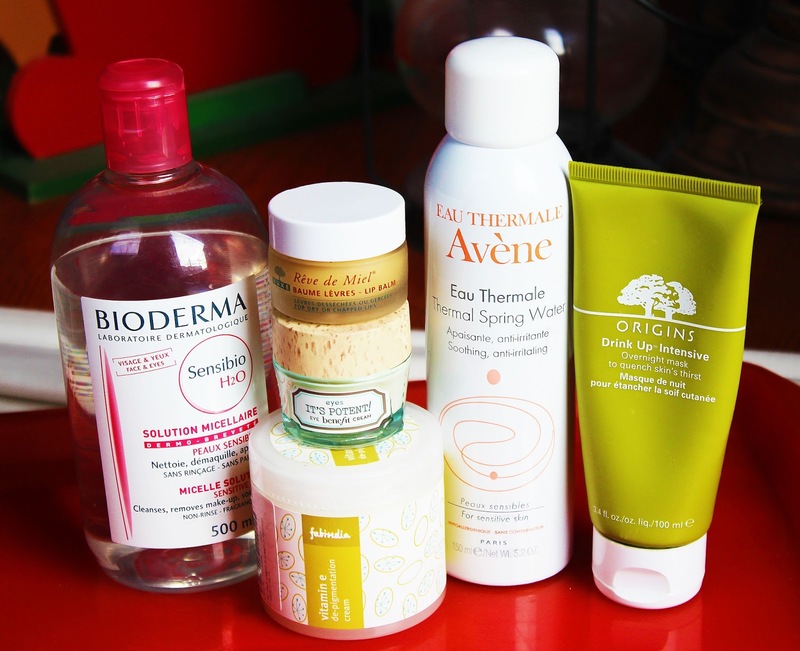 I love experimenting, but these are a few of my current winter skin care essentials that have worked for my normal to dry skin. I never go to bed without taking my makeup off and I am always on the hunt for a new makeup remover/cleanser! This cult favorite is known as a mild soap free cleanser that will remove all traces of makeup. Now, I have to say all the hype around this baby is true! It is light, doesn’t break me out, isn’t drying at all like other cleansers and easily takes all your makeup off. I usually put some of this on a cotton round and clean my whole face. I like this for the winter, because it's not drying on the skin or overly strong which is what I need! However, I do think it isn’t the best to remove eye makeup. A lot of reviews call this an all-rounder, which I don’t exactly agree with. It is great for the face but for my eyes, I need something stronger because I wear a lot of eyeliner(liquid and pencil) and waterproof mascara! I highly recommend it though and works great during the winter time. This is another product that is loved by so many bloggers! Thermal sprays have been such a hype but after trying many, this is my favorite. It is a light mist, not heavy, great for sensitive skin types and just helps calm your redness. I can’t say it’s a life changing product but it has helped me in these cold months to prep and set my makeup as well as just tone my face after all the masks and exfoliators I have been using. It is free from preservatives and has various minerals that help nourish the face! I like it a lot so far and just spraying it after a warm shower or bath feels like heaven. This baby is probably my favorite mask in the world(trust me, I have tried a lot!) It is so hydrating, light and doesn’t break me out. It is made for people with dry skin whose skin needs a boost of hydration, especially during this time of the year! I use the year round because it just plumps up the face and gives it a natural glow. I love putting this on overnight as well as in the shower and then washing it off with a cloth. I even use this on long flights! It smells wonderful and is for sure a holy grail product for me that I will always repurchase. If you buy one thing this month, buy this! This is new to my skincare. I was a little skeptical because its very thick cream but after using it for a while, I actually like it for the winter time. It is extremely hydrating without feeling greasy. I would recommend using a very little amount and warming it up in your hands before you apply it. I don’t have a lot of hyper pigmentation but I do have some pimple scaring(battle wounds)but I think I have to use this more to see a difference in that aspect. Overall though, this is great for the winter time to give your face that moisture and hydration! When I first tried this, I didn’t think it was the greatest eye cream because it was too light and I wanted something thicker. But once I bought something thicker, I had to go back to this. Thicker eye creams are great for night time but when it comes to applying makeup over it, this one is what I reach for. Its lightweight but creamy and hydrates the under eye area perfectly. Its also quite cooling and seeps into the skin well. It is an awesome product if you are looking for something to hydrate those under eyes which I think is very essential in the winter time and year round! For these cold months when my lips are chapped and basically destroyed, this stuff changes it all! It is the bomb.com for your lips! Extremely hydrating, doesn’t feel thick and glides on! I have to say it has a very unique texture, but once you start using it more you will love it. It is a great product though and smells amazing in my opinion. Go check it if you have chippy chappy lips like me right now. Come say Hi! to me on Twitter and Follow me on Instagram! You can also follow me on Bloglovin for blog updates and my Facebook page! I've heard so many great things about Bioderma! I'll definitelty have to go pick it up now. I love the purity face wash by Philosphy! Oooh I love It's Potent! I'm looking for a new eye cream but if I can't find one I like I'm definitely getting another It's Potent. I need a thermal spray! Glad I found your blog. New follower on bloglovin! Thank you! :) It is some great stuff for sure! I love Origins! Thank you! :) I am so glad you found this post helpful! Followed you back!